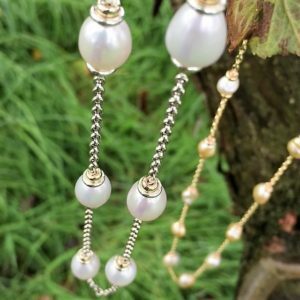 Totally unique and exclusive, this stunning 9ct white gold chain and white pearl necklace is evocative of the cool whites of winter. Made to order, this necklace uses white gold chain and rondels which are quite rare in this country and therefore makes this a very desirable piece for your jewellery collection. 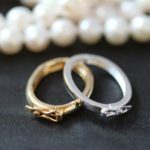 The pearl stations are set with cool white cultured freshwater rice pearls with a subtle pink hue, using pearls which are approximately 12mm x 10mm. The stations use white gold and yellow gold rondels for a charming and fetching colour contrast. 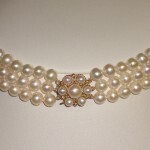 The necklace is 22” finished length. 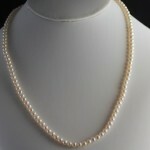 White gold necklace set with pearls. 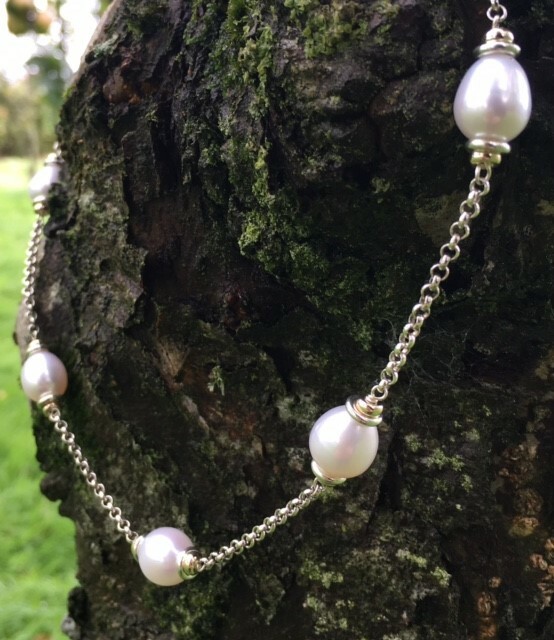 Totally unique and exclusive, this stunning 9ct white gold chain and white pearl necklace is evocative of the cool whites of winter. 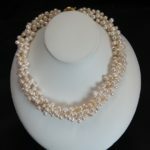 Made to order, this necklace uses white gold chain and rondels which are quite rare in this country and therefore makes this a very desirable piece for your jewellery collection.